Wine asset tags or bottle tags in conjunction with wine cellar inventory software are a great innovation to ensure the database of wine in your cellar is always accurate. 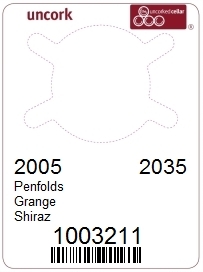 Our Wine Inventory tags come in a range to suit every cellar management need. Bar codes on wine bottles normally do not define the vintage. To use bar codes for inventory control, you should use a unique barcoded label or tag attached to each bottle. The Uncorked Cellar can pre-print bottle tags with a unique tag number, then automatically allocate that unique tag number to bottles as you add wine to your cellar. You can also use The Uncorked Cellar to print custom labels after adding the wine to your wine collection, printing details such as the wine name and vintage - plus of course a unique barcoded inventory number. 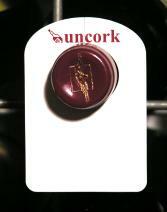 Wine Bottle Neck Tags are the easiest to apply and remove as appropriate from bottles in your cellar. Identify each wine without disturbing other bottles in your cellar. When you remove the bottle from your cellar, place the barcoded tag to one side, then update your wine inventory when convenient by scanning each tag. Easy! Adhesive Asset Labels provide unobtrusive tracking of wines in your cellar. You can print a barcode on the label, then scan that bar code to display details of that wine, or remove the specific bottle from your inventory. Printing the wine name plus a barcode on the Wine Neck Tag allows you to read what is in the bottle without disturbing any bottles in your wine rack. The barcode allows you to scan the barcode to identify or remove that specific bottle from your wine inventory. Printable wine tags cling to the neck of the bottle with unique side tabs. Create your own layout of any field from The Uncorked Cellar including the wine name, vintage, when you should taste it next or when it will be at its peak. The Uncorked Cellar wine inventory management system automatically adds a unique barcode asset number for every bottle of wine added to your cellar, and you can add your own handwritten notes on the back. Print these neck tags with any standard Laser or Inkjet printer. Print your own Asset Labels with the wine name, barcode and other details using any standard Inkjet or Laser printer - You do not require a specific label printer and can be assured the printing will be visible for many years. These self adhesive labels measure approx 1 7/8" x 3/4" (48 x 20 mm) and are an ideal size to place on Snap Wine Tags, or to the wine bottle itself. The unique design of these write-on Wine Bottle Necktags snap on to the neck and prevent the tag from falling off the wine bottle. Made from durable plastic and coated to allow easy writing with almost any marker marker. Alternatively apply Printable Wine Asset Labels (sold separately). A superior tag for home or commercial use.